Fidanza adjustable cam gears are made from the highest quality 6061-T6 aluminum. 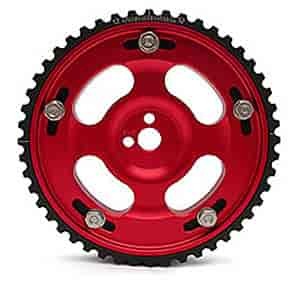 They are CNC-machined to more exacting tolerances than original gears. The tooth edges are beveled to increase belt life. With twelve degrees (both advance and retard) of laser etched adjustments you can be assured of proper tuning. The inner ring is designed for strength, function, and precision. Stainless steel studs are threaded through the backside of the outer gear. The inner gear is then fastened with stainless steel nuts and lockwashers. This enables an increase in the amount of torque used to tighten the fasteners, with no risk of stretching to the aluminum threads. . Does Fidanza 930666 fit your vehicle?